I have mentioned our daughter, Kaylea, and how she and her husband, J.D. are raising missionaries … Well, now she has six children – five boys and one girl – all between the ages of eight and twelve. So, that is a lot of missionaries who could all leave about the same time. And that is a lot of missionary preparation that needs to happen. It is exciting to think about all of those missionaries. Kaylea and her husband, J.D., have regularly bought new suits (beginning with the feature photo shown with this blog – when the boys were eight and under) – and dresses for Lucy. When they bought their first suits for the boys I was excited … I could only imagine how fabulous they must look. I decided that if they were willing to get the suits for the boys, then I, as the Grandpa, should get some “Future Missionary” name badges for them. I went to the local LDS book store to make a purchase. They actually had two badge options. One was the “Future Missionary” that I went there looking for. And the other, I had not seen before. It said, “Missionary in Training”. I just kind of stared at those badges for a few moments as I first saw them. Then suddenly I was overpowered almost by the Spirit. I felt a rush of inspiration about the development of a “Missionary in Training” program for all of those missionaries in that one family – and thought too, of all of the rest of our grandkids. Wow! I had never considered this before. And I certainly would not have thought of it myself. Anyway, after that initial inspiration – for which I am very grateful, I began to ponder and think about what might be in such a program. The ideas kept coming (literally flowed into my mind) as I worked over the next few months to get the ideas and inspiration down on paper. Details of the full program were unfolded to me. And the inspiration expanded to include not just a program for my own grandkids but also to all other parents serious about their charge for missionary preparation. And that’s what this package is all about. It is all about training our missionaries and preparing them now so that they can be prepared to serve anywhere in the world as they are called. It is very much a home and family program designed to help parents and families focus specifically upon the training of their own missionaries – to serve now with their friends and neighbors – as also to prepare them to be future full-time missionaries. “Think of the power of our future missionary force if mothers considered their homes as a pre-missionary training center (MTC). Then the doctrines of the gospel taught in the MTC would be a review and not a revelation. That is influence; that is power.” (“Mothers who Know”, Beck, Julie B., Ensign, November 2007 available at https://www.lds.org/general- conference/2007/10/mothers-who- know?lang=eng). Well, there we have it! That is the challenge for all of us – dads included! We all know that we need to help prepare the next generation of missionaries and we all want to do it … and we probably all wonder how we can rise to the massive challenge of that preparation. So, how do we get started? What do we do? Sure, we can do/have home evening – and everything else that was on my list above – and more … but how can we not only do the minimums, but also keep pace (run like crazy) with the vision of our Church leaders? This program, “MISSIONARY IN TRAINING” might help us all to do that. It might help us get focused to really step up and do as we have been asked. It can be the tool that we all have wanted anyway … the tool for us to really get involved and progressing toward the missionary preparation goal with our children. 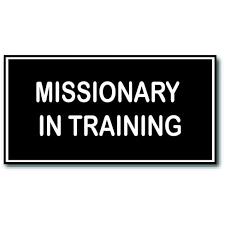 “MISSIONARY IN TRAINING”: The Program really is home evening (as we should have been doing anyway) but with a new missionary focus – and specific missionary preparation activities. The program also involves missionary lessons, an attitude of missionary work, an organization, and excitement to get our children (sons AND daughters) thinking of how they too can commit and prepare to be missionaries. It is not just a one-time lesson on missionary work. It is rather, a total commitment kind of thing. It will take major effort and commitment, and that level of commitment must be for the long-haul … but the results can be phenomenal. Really great things can happen for you and your family as parents gives the program a full effort and that long-term commitment to the children. If you are serious about the missionary commitment for your children and family … If you want to really “Do It” (as President Spencer W. Kimball taught), then this program may be for you … Check it out … see what it might do to assist you in your goals and dreams – your missionary preparation and training responsibilities in the family. “MISSIONARY IN TRAINING”! (That sounds really great but let’s make that “OUR MISSIONARIES IN TRAINING”) … WOW! You can do it through your very own “Home and Family Missionary Training Center” – with you, parents, and your teenage sons and daughters as the Ammonite trainers … and all of your children – of all ages – participating as Future Missionaries. CATCH THE VISION OF THAT … Your own Home and Family Missionary Training Center for your children – a part of “The GREATEST GENERATION of MISSIONARIES!” MAKE THE COMMITMENT … and GO FOR IT! MISSIONS, HERE WE COME! MISSIONARY IN TRAINING (MIT) is a HOME and FAMILY MISSIONARY TRAINING CENTER program. It’s a fun and very detailed program designed to help families (with children – both boys and girls – of all ages) to train their sons and daughters as future missionaries of The Church of Jesus Christ of Latter-day Saints. The program consists of weekly Missionary Study Sessions, monthly (or more frequent) missionary preparation activities, weekly “P-Day” missionary preparation activities, as well as special Home and Family Missionary Training Center conferences. All of these training sessions, missionary preparation activities and conferences are designed to teach and to prepare future missionaries through building testimony of gospel doctrine as well as practical application of needed “missionary life skills”. The MISSIONARY IN TRAINING PROGRAM is a LONG-TERM PLAN, a HOME and FAMILY-CENTERED PROGRAM FOR MISSIONARY PREPARATION – typically to be staged during your regular family home evening times (and the weekly home evening will now be called a “Missionary Training (or “study”) Session”. The program also involves special missionary preparation activities and conferences held on Saturdays or other days as the family organizes its own HOME AND FAMILY MISSIONARY TRAINING CENTER. In addition to the home centered MISSIONARY IN TRAINING program, there is also a week-long “MISSIONARY TRAINING CAMP” (The MTC) program entitled “The Camp of Ammon”. This MTC program – to be held at various times and locations throughout the country – incorporates many of the same learning sessions as MISSIONARY IN TRAINING (which can take a year or two) but study sessions, missionary preparation activities and conferences are all compressed into five days of intense training. Youth have who participated in the MIT program at home and who also attend the MTC “Camp of Ammon” program can help to motivate, inspire and encourage other Camp of Ammon participants. And they will return from the Camp of Ammon supercharged to be “Ammonite trainers” in your own Home and Family Missionary Training Center. Check out both programs on the internet at www.missionaryintraining.com. The MISSIONARY IN TRAINING PROGRAM will strengthen youth resolve to serve missions, will pull your family together in a marvelous way and will get everyone thinking about being missionaries now and in the future. The MISSIONARY IN TRAINING PROGRAM will be beneficial to your family and others – in so many ways – and it will be great fun for you and all families, everywhere. This is a home and family centered program designed to help accomplish the mission and objectives of The Church of Jesus Christ of Latter-day Saints for missionary preparation and the family. It is a “program with a plan” to help parents serious about their parenting responsibilities and opportunities. And while the program is congruent with Church policies and objectives, it is not a program of The Church of Jesus Christ of Latter-day Saints nor is it endorsed by the Church. As the Director(s) of your own Home and Family Missionary Training Center, you can commit yourself (yourselves) to active, deliberate and focused missionary training for your children. You can help them to prepare to be effective missionaries. You can prepare them to be ready to serve whenever and wherever they might be needed in the world. You can determine the level of participation and training for your own family. The Missionary in Training program is a comprehensive package designed to assist you in your parental responsibilities and opportunities. But, the program, and your use of it, is still flexible. You should utilize the program as desired to meet the needs of your own family – while also maintaining your own family traditions, goals and activities. The program is designed as a tool to help you achieve your own family objectives. The Missionary in Training program is designed to be fun and exciting. This is not something you “have to do” but as you CHOOSE to do it, your family will have some really great times together. You’ll later look back and rejoice together in the missionary preparation for each family member – and ultimately your missionary success – through your posterity – throughout the world. Kevin Hunt is an author, blogger and speaker. He writes regularly on three different Scouting blogsites and shares his insights about Scouting, Scouting in the LDS Church, and other subjects. 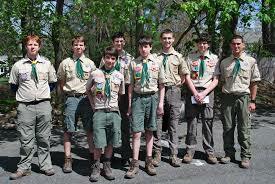 New blogs are posted on his Facebook page: Scouting Trails Books and Blogs. “Recently I have felt some desire to write to you both. I wish to make amends where necessary and help inspire and instruct you in your preparations for missionary service – especially with the changes that are currently taking place. I feel as though I haven’t always been a very good example to either of you. Throughout our early years, I spent a lot of time being the bully and a pretty big jerk. I realized the error of my ways before leaving and tried to be better – but never really went through the complete repentance process, I think. So, I wanted to apologize to each of you and let you know that I was in the wrong – “For the natural man is an enemy to God, and well be forever, unless he yields to the enticings of the Spirit.” I would also ask for forgiveness from you both. Will you forgive me? I hope that we can all learn from my poor choices and be better people because of it. It is an exciting time to be a missionary! I don’t know if you know about what is taking place at all, or how much you may know. But, I figured I’d give ya’ll a live – “from the field” explanation of some of the new changes and maybe in some way, help prepare you both for when that time comes. As I became a missionary, they had just recently done away with the memorized discussions. So, in the MTC, we learned how to “Teach by the Spirit” by writing outlines of what was contained in the old 6 discussions. That worked great, for the most part, and prepared us for now. In the MTC, we were given a lot of materials to help us teach. 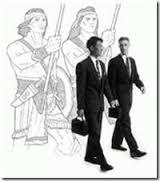 We had the discussions, the New Member Lessons, The Missionary Guide, and the Missionary Gospel Study Program booklet. All of that totaled about 700 pages of information. Well, the General Missionary Committee, The First Presidency, and Quorum of the 12, decided they wanted to reduce all of that to one book – with no more than 250 pages. They did just that. The end result was “PREACH MY GOSPEL”. It is an amazing tool for missionaries. It is designed to make better missionaries and to teach them how to study better and to learn and teach the doctrine of the church. With “PMG” comes a revised set of lessons (rather than “discussions”) which teach the same doctrine of the 6 discussions, but much simpler – and in only 4 lessons. We then study the lessons, and create our own lesson plans to include: 1) the doctrine, 2) Supporting scripture(s) and 3) Teaching “by the Spirit”. The bold, clear, and direct commitments were somewhat overlooked before, so this all focuses on commitments and being BOLD. All of this is what you can expect to learn, live and teach. There have also been other more minor changes: A set 30-minute workout time, unified area books and a number/people tracking system for reporting. I feel as though I am here preparing the way for you. I’ve thought a lot about you both with these new changes. “Raising the Bar” and “Teaching by the Spirit” were mere preparations for this new way of life and work. I am part of that generation of missionaries. But, you are both part of the next generation – which I would say is greater. You will both come into the field after all these preparations have been made and implemented. You are to be the greatest generation of missionaries – for you will have the greatest tools available to be better missionaries and to teach better! Never before have missionaries been endowed with as much as you will be! You must have a testimony of Jesus Christ and His Atonement – as well as The Restoration and all that comes with that knowledge. Memorize D&C 50:13-22, as well as D&C 4. Live the Gospel completely. You can’t afford to deviate in the least. Repent and purify yourselves. Be a missionary NOW! Go on exchanges, help teach, talk to your friends who are not members. Save money for your mission and for afterwards. Pay your tithing and fast offerings. Appreciate mom and dad’s counsel – as well as that of other leaders – and live it. Hopefully, I’m not preaching to you (or to the choir) but these are things that I could have done better at – and that I know will help you to be more prepared to serve the Lord. Look forward to missionary service. It’s AWESOME! One more piece of advice and then I will close. Don’t worry about girls and getting all serious with them before leaving. Just have a good time and get to know a bunch of people. Ninety per cent of them girls that you hang out with now will be married by the time you get home, anyway. I promise! Although his counsel is now ten-plus years old, it is still very valuable for today – even though the pace of missionary work has quickened manifold even since that time. And with recent changes in missionary age for service, and all that we have heard about “raising the bar”, our preparation of future missionaries must be stepped up and taken to new and higher levels. And with the recent announcement by President Monson – about boys being able to serve at age 18 and girls, at 19, the preparation of missionaries rests very squarely – and with a lot of force – upon parents and families. It now must all happen before the children graduate from high school. Seminary, Scouting, Priesthood and Young Women can all help but very clearly, the responsibility now – more than ever – is upon parents and families.